Rob Fahrni is right: while it could've been worse, this is still a mistake. One of many. Way too many. It stuns me that so many people are still kowtowing to this insult of an administration. I hope that when my kids are older, they look back at this period in our history as an aberration rather than as the time "when it all started." Just a quick note to say I've added a comment feed to this blog. So, truth be told, I'm kind of disappointed that RSS is still so tied to blogs. Yeah, it's great to know when my favorite blogs have new posts, but RSS offers so much more than that. I think of RSS as a non-intrusive alert system. It tells me about new stuff, which usually means new blog posts, but in my case also includes incoming Gmail, bug reports from FogBugz, recent posts to our support forums, problem reports from my Feedburner alert feed, my NetFlix rental queue, and numerous other non-blog items. So really, my feed reader is my universal inbox - it's the tool that lets me know when there's something new that I might want to pay attention to. But when you think about it, the stuff we've already paid attention to is often just as important as the new stuff that's demanding our attention. It's nice that I can subscribe to a feed which brings me new YouTube videos, but why can't I also have a feed which shows me what I've recently watched on YouTube? Or one that lists the songs I recently previewed on iTunes? Or how about a feed of my Amazon purchases? And why not a feed of the people I've met on MySpace? This is the kind of stuff we should demand from the services we use. Most of them already record everything we do, so why can't we get that information back in a form that's useful to us? You know, like an RSS feed? We could even choose to share our "attention feed" from one service with another service to help it provide information that's more relevant to us. I realize there are lots of geeky details I'm leaving out here (for starters, my attention feeds would have to be password-protected and not automatically shared with the world at large), but the basic idea sounds good to me. If the information that's being collected about me was given back to me, my aggregator could stop being a "what's new" tool and become a "My World" application that shows what I've paid attention to in the past, present and possibly future. You're now subscribed to an RSS feed which will bring you new videos matching your keyword (screenshot). 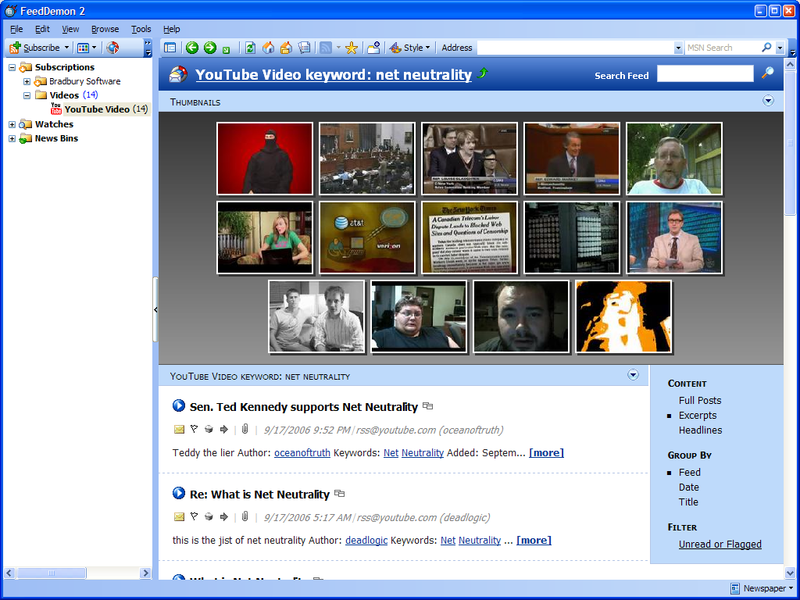 PS: YouTube offers a number of other RSS feeds (via Dave Winer). If you're considering writing a tool which reads web feeds, you probably think you can focus on the user experience and rely on an off-the-shelf XML parser to do the grunt work of parsing RSS and Atom. Unfortunately, I'm about to piddle on that idea. Given the sheer number of invalid feeds I ran into, I decided that #1 wasn't an option (after all, customers would complain if FeedDemon failed to handle feeds that existing aggregators had no trouble with). So I ended up writing my own XML parser, which was only slightly more enjoyable than a sharp poke in the eye. And as it turned out, my hand-coded XML parser was FeedDemon 1.0's Achilles' heel. I received countless bug reports that were caused by oversights in my parser, and countless more related to how I chose to interpret invalid feeds. If you're building a tool that needs to handle feeds that aren't well-formed, you may still be able to use a third-party parser if you correct these common mistakes. Although fixing well-formedness errors isn't a task for a novice programmer, it's still simpler than coding an XML parser, and overall this approach has worked well for me. 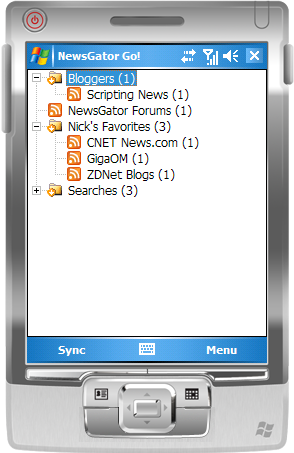 Today we announced the release of NewsGator Go!, which expands our feed synchronization platform onto Windows Mobile devices. I spent some time last week playing with NewsGator Go!, and I loved how I could sync my feeds between it and FeedDemon (plus NewsGator Online, NetNewsWire and NewsGator Inbox as well!). Kudos and congrats to Kevin Cawley for his excellent work on this product. PS: I'm planning to add native Live Writer support to the next version of FeedDemon.